I don’t even know where to start! The whole thing was so big and brilliant and unlike anything I’ve ever done before. I’m writing this on the plane home (in business class, which is a whole experience in itself!) and feeling tired as we had to get up very early to catch the flight home but I want to try and get all my thoughts about the trip written down as soon as possible so that I don’t forget anything. Besides, when I get home I have work to catch up with and a 2 year old daughter to spend time with who I have missed soooo much! A week is the longest time I’ve ever been away from her! I’ll start at the beginning. Henry and I (because we were allowed to bring a partner with us!) left in the very early hours of the morning for the airport. It always feel very exciting to be leaving your house in the middle of the night when it’s dark outside and everyone else is asleep to jump in a taxi and whizz off to the airport. When we got there we got to go into the business lounge because a perk of the festival was that we were able to travel business class! It was actually Henry’s birthday this day too! In the business lounge there was a huge selection for breakfast that we could just pick and choose from which was all presented so beautifully. It was a real novelty for us! The plane ride was a novelty too as I have never flown business class before. It was the most comfortable flight I have ever been on in my life. The seats actually went all the way backward so that you could lie down and snooze. There was loads of foot room and a little table with all sorts of drinks and things on it. It felt incredibly luxurious compared to economy. They even laid out a little table cloth for the in-flight meals! So much legroom in business class! We arrived in Dubai at 8pm local time on Monday evening. My parents used to live in Dubai, so I’ve actually been there a few times before. You can read about some of my previous visits on my other blog here, here and here. It was lovely to be back. I always love the smell of the air in the Dubai: warm and dry and suffused with incense. I love the sparkling white pillars in the airport and all the marble and high ceilings and big, open spaces. A lot feels very big in Dubai. The cars are all huge, the motorways have about 8 lanes and of course the city is awash with skyscrapers all glinting in the bright sunshine. We were picked up by a taxi and taken to the Crowne Plaza Hotel where we had been upgraded to a lovely Creek-view room. We went to the hotel restaurant for some late dinner, popped down to the authors green room to say hello to some of the organisers and then fell into bed! I didn’t have any sessions to do on he first day but we went to the authors’ welcome talk where we saw a children’s choir singing and heard speeches from various important people. Tony De Saulles, writer and illustrator of Bee Boy and a fellow OUP author, came over to say hi! I always really enjoy meeting other authors and illustrators as there are always things you have in common to chat about. It made me feel a bit more at ease to talk to another author who had flown out for the festival. After the authors’ welcome, Henry and I went for lunch. We had been given meal vouchers for the hotel restaurant, Anise, so we ate there pretty much every day. The food was fantastic! It was an international buffet with an absolutely huge selection. I was especially excited to see the sushi station where you could just pick and choose whatever you liked and have as much as you liked. There was also a fabulously irresistible dessert counter full of delectable little cakes and puddings. My favourite was a dark chocolate-covered mousse cake which had sharp blackcurrant compote inside. Later in the afternoon we went swimming in the pool for a bit, then sat in the hot Jacuzzi which overlooked the creek. The desserts at the hotel restaurant were fabulous! That evening all the authors were invited to take a coach out to the desert for a starlit meal and poetry performed by poets from all over the world. It was a really lovely experience. We were welcomed with singing, dancing, drum beating, camels, coffee and dates and then we were able to fill our plates with delicious Middle Eastern food from a buffet set up on the sand. There were lots of seats arranged in a semi circle around a stage where we sat and ate and chatted. I found myself sitting next to Tom Mclaughlin and his wife. Tom is yet another fellow OUP author and we discovered that we even work with the same editor and designer on our books! The following day it was time to actually do some work! A taxi picked us up at 9am for a visit to the nearby Cambridge International School. They gave me an incredible welcome once I arrived with a bunch of flowers, a giant Isadora Moon card they had made and they even performed an amazing song all about Isadora Moon which the children had written (see the video below)! They had put so much effort into preparing for my visit. After my talk (which included drawing together, questions, a reading etc… the usual stuff I would do in a UK school) it was time to sign books. It was so brilliant to meet children of all nationalities in a school abroad and get the chance to talk with them and share my books. On Thursday I had another school visit, this time at Dubai British Foundation school, which also went really well. the children were younger this time and I had longer with them. We created our own hybrid creature, played the ‘can you guess what’s in the bag by feeling it’ game, did an interactive reading and did some drawing. The staff were so welcoming, friendly and helpful and the children were just lovely. Thank you so much to both schools for having me to visit! It was truly a wonderful experience! In the afternoon, Henry and I took a trip to the Gold Souk down by the Creek. We had to get in a taxi to get there and it was a bit of a longer trip as Thursday late afternoon is the end of the working week in Dubai: they have their weekend on Friday and Saturday, and go back to work on Sunday. It was so nice to walk through the Gold Souk and peer into the windows at all the sparkling jewels. I adore looking at jewellery and I always think that if I hadn’t become an author and illustrator I would have liked to be a jewellery designer. I went to see if my favourite necklace was still there and it was! About six years ago I spotted this beautiful diamond star necklace in this one shop and whenever I go to Dubai (which is rarely!) I always like to go back and see if it is still there. I mentioned it in both my 2012 and 2014 blog posts about my trips to Dubai! It’s the most incredible piece of jewellery I’ve ever seen and if I had £5000 to spare I would snap it up in an instant! Haha! I mean, I might snap it up. I think I would always feel guilty spending that much money on something so frivolous for myself but it’s nice to dream. It’s a Victoria Stitch necklace for sure! The next day, Friday, was my busiest day at the festival. I had a festival presentation in the early afternoon. For these I do a little performance about the adventures I go on to get inspiration for Isadora Moon books, using lots of props. The event was lots of high energy fun and I really enjoyed it. 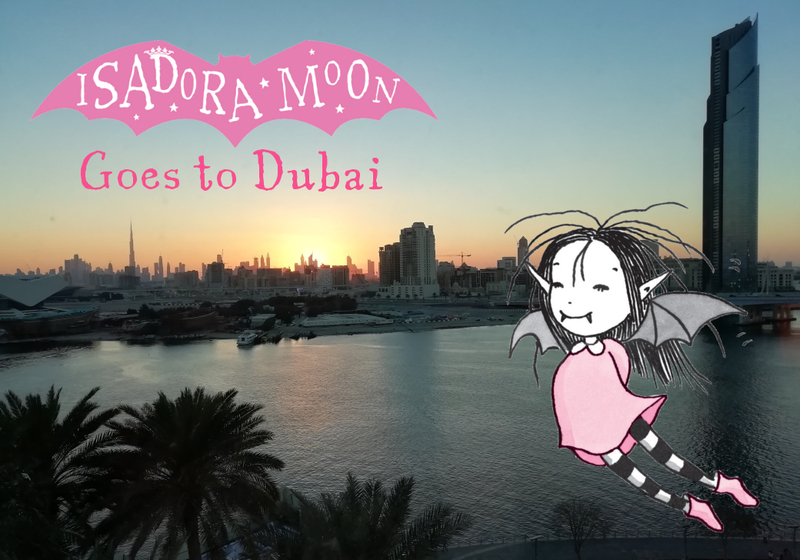 Lots of children came, a few of them even dressed up, clutching copies of Isadora Moon they had brought from home! In the evening I had a second event, which was a panel discussion with Keith Stuart and Ian Rankin about ‘Making a Monster’. This was something very different for me – I am used to only presenting to children! – and I must admit I felt a bit out of my depth during it. Hopefully I said something of interest though! On stage with Keith Stuart and Ian Rankin. Thanks to Georgina Godwin for chairing the discussion! It was quite an in depth and dissecting sort of discussion about what makes a monster, going into some quite dark topics such as serial killers, and it was extremely interesting to hear what Ian Rankin and Keith Stuart both had to say. I never knew that Ian Rankin had been excorsised! He told us there’s a video on YouTube of it happening! It’s interesting because I feel that with Isadora Moon, instead of ‘making a monster’, I’ve sort of un-made a monster. Or you could say, humanised a monster. Isadora Moon is half vampire but she’s not scary or dangerous at all and nor is her vampire dad: he drinks red juice instead of blood. Oscar the ghost, the dragon from Gets in Trouble and even the fluffy fairground monsters from Goes to the Fair are all either misunderstood or just a little mischievous instead of actually menacing! As I alluded to in the sub-heading, it was also my birthday on this day, although I kept forgetting it as I was so busy! I was reminded though at the end of both my events when the audience sang happy birthday, which I had no idea was coming! It was a lovely surprise both times and quite novel to have so many people all singing it to me at once! The audience and panel sang Happy Birthday to me! You can barely see them because they’re so small, but all the children are holding their mini Isadora Moon books! The final day of the Emirates Literature Festival was a lot more relaxed. All my major, more nerve-wracking events were over and I just had a small crafty workshop in the morning. The children and I made a load of teeny tiny Isadora Moon books (free download to make your own here). We also did a quiz, some drawing, and some other games. Afterwards, we just chilled in the room and by the pool for a bit. Around three o’clock, it finally occurred to Henry and I to make use of our festival passes which gave us free entry into any events. We’d been so busy all week we hadn’t even thought of going to anyone else’s events! After a quick look through the programme, we headed downstairs for a panel discussion on ‘What is art for?’ At first I was worried it would be too intellectual for me to follow, but it was actually fascinating. I did get a bit lost at certain points (I’m not going to pretend I understood everything!) but I got the gist of it and the highlight for me was seeing Patricia Miln‘s beautiful work up on the PowerPoint. I actually ended up having a long chat with her later on when I bumped into her at the gathering before the authors’ farewell dinner. She’s a fascinating lady. I loved her striking style of all black with thick black-framed glasses and hearing about her white, minimalist house! Finally, it was time for the authors’s farewell dinner which was held in a grand room with lots of round tables. We sat with Fabi Santiago and her partner, and also with Pamela Butchart and her husband and adorable baby (which was kind of comforting because I was missing my own baby!) It’s been so nice to meet and talk with all the other authors and illustrators on the trip! Gillian Cross was another (OUP) author I met and really enjoyed talking to! I feel like the children’s book industry is particularly full of friendly and fun people. Pamela Butchart, author of the ‘Izzy’ series, and me in our costumes. Also during the dinner, I had been asked to make a short about my experiences at the schools I had visited. I went up and shared about the lovely welcome both schools had given me and what a new and different experience it was to visit non-UK schools for the first time. We said our goodbyes and headed to bed, ready for an early morning ride to the airport in the morning. Coming home, I feel I’ve had a truly amazing trip and I am so grateful that I was asked to come out and be part of it. Thank you so much to Emirates Literature Festival for inviting me and looking after me so well! And thank you to all the organisers, volunteers, and hotel staff out there who made it such a fantastic week! Also I need to say thank you to my wonderful husband Henry who is such a support to me and who does a lot behind the scenes for Isadora Moon. He was there the whole time in Dubai, making sure I was all ready and prepared for my events, standing on the sidelines and making sure everything ran smoothly. He was also an essential emotional support. I don’t know if it was because I was abroad and everything felt so different and unfamiliar or because of the hot weather and jetlag but I did feel unusually anxious and panicky before my events out in Dubai. Henry was there to calm me down and hand me a bottle of water and a kalms and tell me it would all be fine and that I would get through the event wonderfully… which I did thankfully! I feel like no one else would have known that there were moments out in dubai I felt like a duck paddling furiously under the water to keep afloat while appearing perfectly fine above the surface. And I WAS perfectly fine a lot of the time, there were just a few times where everything felt very intense and surreal and I would flip into feeling as though I was in a dream, which was really unsettling. Thinking back, I reckon it must have been a lot to do with jetlag, or maybe the constant spikes of adrenaline I was getting, or actually maybe the fact that I was separated from my two year old daughter for so long. Whatever the reason, my motto is to feel the fear and do it anyway… and I’m so glad I did! Even though I had visited Dubai before, I never imagined I would be flying back out there as part of my job. It’s funny because when I dreamed of being an author and illustrator I envisioned days of sitting alone in my studio at home, working away on my writing and drawing and being lonely and solitary, not performing on stage. When I fist started out working on picture books for US publishers, that is how my professional life was. But ever since Isadora Moon has come out in my home territory, I’ve become increasingly aware of the value of going out and talking to children and audiences about my books. It’s something I’ve had to learn though, and build up to, as I don’t think I was ever a natural performer. Thankfully, I now feel extremely comfortable up on stage performing my festival routine to a roomful of children or presenting a school event for an assembly, but that’s just through having lots of practice. I do always get that frisson of nerves just before but on I’m up there I’m usually fine and I enjoy it! The panel I did with Keith Stuart and Ian Rankin was something completely different to what I am used to, and that did put me way out of my comfort zone, but it was a very interesting experience ad I am grateful for that. And who knew I would end up on stage talking about serial killers and horror films with two ‘grown-up’ novelists?! Overall I had the most amazing time and I will never forget my week out in dubai for the emirates literature festival. It was like nothing I’ve ever done befire! It was an absolutely wonderful experience!